Orders must be received before 3:00 p.m in the to assure same-day delivery. Please call to request a specific delivery time. Orders received after that time will be delivered the following day. We will do our best to accommodate deliveries at specific times of day, but we cannot guarantee it. We are unable to guarantee balloon delivery at a specific time; deliveries are normally made within a time frame of a few hours. During major holidays delivery hours are extended. If the recipient's address is incorrect and delivery was attempted to the address, there is a $10.00 address correction fee. We are not responsible for deliveries made to incorrect addresses submitted by the customer. If such a delivery is made, the customer assumes responsibility for the entire purchase. The customer assumes all liability for requests to leave bouquets. We cannot be held responsible for missing or faulty product due to this special request. Blow It.ca will make every attempt to fill the order as requested. However, due to the nature, seasonality and availability of balloons it is sometimes necessary to make substitutions of equal or greater value. As well, if a specific weight or other items are not available we will make a substitution of equal or greater value. We will make every effort to maintain the "look and feel" of the specific arrangement by the overall shape, size, style and colour combinations of your bouquet. If an order is for a Happy Birthday bouquet, for example, if a particular 18” Happy Birthday Mylar balloon is not available, a substitution of another 18” Mylar Happy Birthday balloon with same colour combination will be made. Order cancellation may only be done by phone. For cancellation you must call 1-855-HELIUM (1-855-543-5486) during operating times, please note you must speak with live operator for your order to be cancelled. We do not accept cancellations by email or after-hours voice mail. Orders can only be cancelled 24 hours prior to delivery time. Once an order is placed, a series of events begins, ensuring accurate routing and a timely delivery. If an order is cancelled, these steps must be reversed, involving significant administrative time. Our cancellation fees are used to cover the cost of this effort. There is a standard $15 cancellation fee for basic orders placed online and a $20 cancellation fee for basic orders placed by phone. If an order is cancelled after the deadline noted above, the full value of the order would be forfeited. This cancellation policy applies to orders cancelled on the same day as they are placed. In cases where special order service has been provided, additional charges may apply. Many hospitals do not allow latex balloons, therefore only mylar balloons may be sent with hospital orders. 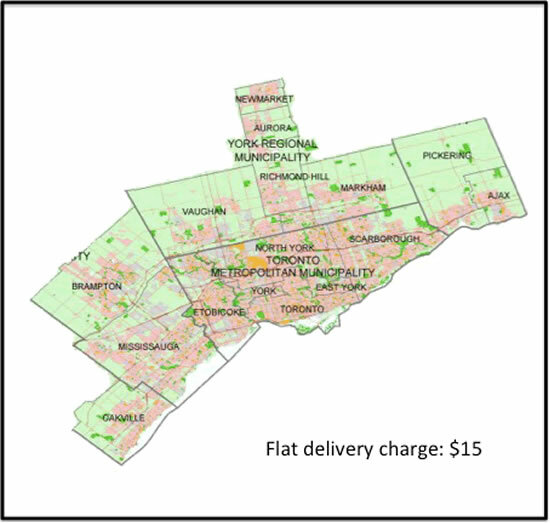 We currently serve the Greater Toronto Area with delivery charges as illustrated in the map above. If your required delivery address falls outside of this preset area, please do not hesitate in giving us a call and we would be glad to assist you in arranging delivery for an additional charge depending on the additional distance from our regular delivery area.